The OSCE Parliamentary Assembly will observe the presidential election in Azerbaijan proceeding from an unbiased and neutral position, OSCE PA President George Tsereteli said during a meeting with Azerbaijani Foreign Minister Elmar Mammadyarov in Baku on March 12. 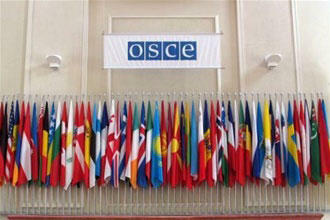 The sides discussed issues of cooperation between the OSCE Parliamentary Assembly and Azerbaijan. They stressed importance of constructive dialogue and development of ties in the spirit of mutual understanding. Tsereteli expressed confidence that the holding of the first international session of the OSCE Parliamentary Assembly's Silk Road Support Group in Baku would make a significant contribution to strengthening of the cooperation. The active participation of the Azerbaijani delegation in the work of the OSCE Parliamentary Assembly and the initiative to develop cooperation was positively assessed. During the meeting, the sides exchanged views on the negotiation process conducted with the mediation of the OSCE Minsk Group co-chairs for the settlement of the Armenia-Azerbaijan Nagorno-Karabakh conflict. Mammadyarov stressed that attempts to change the internationally recognized borders of states with the use of force are unacceptable. The minister said that the Armenia-Azerbaijan Nagorno-Karabakh conflict should be resolved within the internationally recognized territorial integrity and sovereignty of Azerbaijan on the basis of the relevant resolutions of the UN Security Council and the Helsinki Final Act. At the meeting, the sides also touched upon the forthcoming presidential election in Azerbaijan. Mammadyarov stressed that the election will be held in a free, fair, transparent and democratic atmosphere and will reflect the will of the people of Azerbaijan. The minister noted that the Central Election Commission (CEC) is professionally performing preparatory work for the upcoming election. The sides exchanged views on the prospects for development of relations between Azerbaijan and the OSCE PA, the issues on the OSCE agenda.